Oculus users get ready, the most intense fitness game in virtual reality has finally come to the Oculus Store! Of course, HTC Vive users, alongside intrepid Oculus veterans who are familiar with buying from Steam have been enjoying this most brutal of exercise routines since the summer of 2016. However, its arrival on Oculus’ own storefront is significant as it opens up the game to a potential new user base. Until fairly recently if you wanted to work out in VR you had to go to Steam. The Oculus Rift was originally designed for fairly sedate seated experiences and forward facing standing games. In recent months that trend has shifted with some positive fitness-focused additions to Oculus’ storefront offerings. Sprint Vector and the VRFitness Insider favorite BoxVR both launched this year on Oculus and have sold very well, demonstrating the demand from Rift users for active, calorie-torching titles. Any lingering doubts as to whether people really like working up a sweat in VR were sliced to smithereens with the launch of Beat Saber, a smash hit and so far virtual reality’s best selling game. So clearly the appetite is there for virtual reality exercise and thus Thrill of the Fight’s official launch on Oculus is a welcome one. However, unlike Beat Saber and BoxVR, which are simple forward-facing standing experiences, The Thrill of the Fight is proudly a room-scale only game. This places certain demands on your setup and you may need to purchase accessories to enjoy it fully. Furthermore, this is by some margin the most physically intensive game available in virtual reality. It’s brutally unforgiving in the most awesome way possible. With that in mind, we’ve put together a handy guide to getting the most out of the game. Let’s go! The first thing you need to know about The Thrill of the Fight (from here on I’ll use the acronym TOTF) is that it’s a 360-degree room-scale title. The game turns your playspace into a virtual boxing ring, that you can fully move around in, in any direction. Therefore a rear sensor is absolutely essential! The ring is scaled to the size of your play space, so the larger area you have, the bigger the ring in which you fight. To have a really good experience you must have a large enough play area to be able to turn around and move forward and backward. A clear unobstructed playspace, as big as you can make it! See my guide to setting up your playspace here and adding a third sensor for room-scale here. Be aware that this game has you bobbing and weaving in all directions. Unlike BoxVR you will have to turn behind you and move forward and back. So clear everything out the way and be mindful of walls and your computer desk! If you’re going to be moving around in your playspace you’ll need to make sure your cable cord is long enough. I twice wrenched my headset cable out of my pc, toppling the whole tower in the process whilst playing this game, before I bought extension cables to give me another metre of cord length. My room-scale guide will give you more detail, but basically, you’ll need an HDMI cable and USB 3 cable, easily available from Amazon. Ugreen and Amazon Basics brands both work great. Another point to bear in mind is this game will quickly have you sweating like that guy from Airplane so you need to sweatproof your headset! 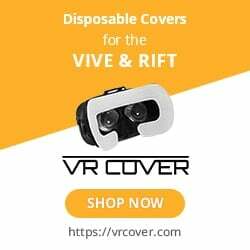 VRCover makes the best third party replacement interfaces and covers for your Rift. I personally find their thin black faux leather foam pads the best for comfort. They have breathable holes and you can wipe them clean afterward. I’d also strongly recommend buying a headband, the less sweat that goes into your headset the better! You can learn more about how to prevent sweating in your HMD here. Hopefully, you’ve now got a decent idea of the game’s setup requirements and extra accessories you may need to buy. If you don’t yet have a third sensor and are wondering if it’s worth the investment. Trust me, it is! Virtual reality truly comes alive when you can physically move through your playspace rather than just stand facing forwards, and the investment will quickly pay for itself. Likewise with the cable extensions. Don’t risk breaking your headset by pulling out the cord during gameplay, make sure you have enough cord length! With setup out of the way let’s look at little at the game itself. Playing this for the first time can be something of a shock. If you’re out shape this game can be brutally hard. You may find yourself gasping for breath after the first round, and wonder if you could ever make it through a full 12 round fight. I promise you that with practice, you can and that it even becomes enjoyable. You just might need to work on your cardio and technique first! The immediate reaction for most when placed into a TOTF fight for the first time is to swing and flail wildly, throwing a flurry of swinging wide arced hooks that leave you exhausted, potentially punching your walls and furniture, whilst making a disheartened poor impact on your opponent. A common complaint on the Steam discussion boards goes along the lines of ‘I hit him with multiple haymakers to the face and he just took them all and then dropped me with one hit, this game is so unfair!’. This is by design. The game awards precision hits rather than swinging for the fences. Both your game character and your opponents have weak points, small target areas where landing significant strike awards a damage bonus. In order to get knockdowns and hurt your opponent, you must target these weak points with regularity. Thus accuracy and punching efficiency is important. The gym section of the game includes a handy training dummy, with these weak points marked as X’s, Practice hitting these areas and pay attention to the punch stats on the board to the right of the dummy. In addition to showing you the force of your shots, it will also show you the damage multiplier bonus awarded for each hit. If you don’t hit a weak spot, it will read zero, strike the general area might see a 5 to 8% percent damage bonus. If you time it perfectly however and strike that weak point perfectly you might see a 25% percent damage multiplier boost. These are the kind of strikes that will have your opponent reeling! VRFitness writer Tim Donahey discussed gameplay with the developer Ian Fitz himself, who provided 10 top tips for fighting success. This should be your starting point for learning how to master the game. You can read the article here. Youtube is a great resource to see how others play the game and learn some basics. I particularly enjoyed these two. The first shows you just how fun, and exhausting the game can be, whilst in the second you can see how somebody improves their technique over time. Finally, the game has a tremendous active community on the discussion board for the game over at Steam. The developer Ian Fitz is incredibly active, both on the boards, and in producing game updates. Any questions you have he is always happy to answer so feel free to browse the boards and join in the conversations there. In a future article, I will show you how to customize your training routine with TOTF using progressive overload principles. TOTF has a tremendous long-term fitness value, I have over 50 hours now played. See you in the next article!